Are you a wine hobbyist with a small assembly of favorite wines? Or perhaps you are a full-fledged wine connoisseur who has amassed a broad range of vintages? Whatever type of oenophile you are, you need a home wine rack to house your collection. If you’re having trouble deciding on one of the racks we recommend up above, then take a moment to see what our editors have to say about each model. Below you’ll find some short reviews on each one to let you know what our editors like about the selections. Read through these reviews in order to make your decision on the best wine rack for your kitchen. Looking for an elegant way to conveniently store your wine collection? 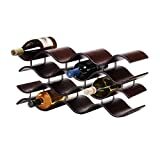 This rack will hold up to six bottles of your favorite wine and can be placed on your counter or on the floor. The graceful arch handle makes lifting the rack easy, and with the handle’s fold down capability you can store the rack under virtually any kitchen cabinet! The sturdy metal construction will ensure that your bottles never fall out or tip over, resulting in broken bottles and lost money. The black finish matches almost any decor. The Oenophilia Arch Wine Rack also features additional plastic feet to protect your countertops. Are your wine bottles turning into a clutter spot in your home? 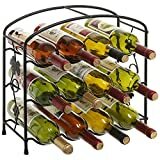 This wine rack will turn them into an organized piece of decor with each jewel-like color of the bottles shining as they line up side by side three rows high and four wide to hold a total of twelve bottles of average size. This storage devise is not something to be tucked away in a pantry, it looks great on display for the best of the collection, right on the counter-top. The rack is made of a sturdy metal that will not buckle under the weight of the bottles. It is designed so the bottles can lay on their sides and keep the corks wet, to avoid oxidation. The sleek black brushed metal with grapevine accents is both sturdy and attractive. Pros: Easy to use as it is already put together, just fill with wine bottles. Cons: Doesn’t fit more than 12 bottles. 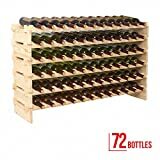 If you’re looking for a sturdy wine rack that will hold 24 bottles and as many as 24 slim size wine glasses, check out this one from Winesome Wood. Comes in two colors, espresso and natural. It is 31.5″ wide x 16.2″ deep x 35.6″ high. The large top surface has room for serving drinks and hors d’oeuvres. Solidly constructed from composite wood. Built to last whether you use it in your living space or in your storage area. Holds most sizes of bottles easily. This wine rack is easily assembled with the included tools. Are you looking for a sophisticated and elegant countertop wine rack? This Indonesian style wine rack by Oenophila looks like waves along the Bali shore. The dimensions are 21 x 9 x 12 inches which comfortably holds 12 wine bottles. Available color options are crimson or ebony that will easily match or make waves in any space. This wooden wine rack is a graceful yet dramatic accent to any decor. The space saving design can be used vertically or horizontally, and It will fit almost any size bottle. Makes the perfect gift for any wine lover on your list. If you love wine and have been searching for the perfect way to store it in style, this is the rack for you. The elegant, two-tier wine rack can hold up to 18 bottles of your favorite wine, with each tier holding 9 bottles. It is made from 100% solid bamboo, making it beautiful, durable, and versatile. If you’re looking to store more than 18 bottles of wine, these racks can be placed side by side or stacked on top of each other. The wave bars quickly snap together with interlocking blocks, making for easy assembly without extra hardware or tools. The Oceanstar Stackable Bamboo Wine Rack weighs about 10 pounds, making it a nice size for use and gives you a variety of placement options. For example, place it on the top of the refrigerator if you are short on space. Pros: Literally a snap to put together, solid bamboo structure stable, easily painted if you prefer color to wood finish, and a beautiful addition to any room. Cons: The bottle waves are too large for some bottles, making them slope downward, and small bottles can be dislodged if the structure is bumped. Store your favorite bottles of wine in elegance. This wine rack is creatively designed to hold 23 bottles horizontally to keep the cork moist because the wine will stay in contact with the cork. This will help your wine stay fresh longer. Sorbus carefully designed the Bordeaux Chateau style wine rack to be a beautiful addition to any home. The sleek black color and creative form makes it easily fit into modern contemporary, antique, or traditional home décor. 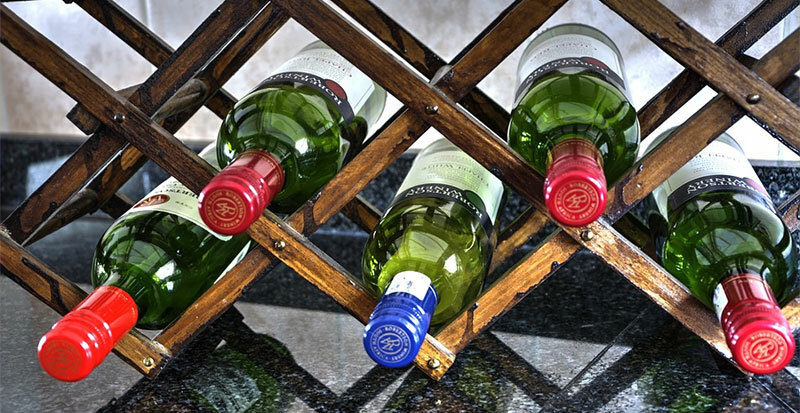 The strong castings are designed to create a sturdy and durable wine rack to last for years to come. The wine rack is compact to fit into small spaces and designed to make it easy to move from one place to another. It is fully assembled and ready for use. Pros: No assembly required. It has a securely built frame for stability and durability, compact for small spaces, easily moved, fits a variety of bottle sizes, and has an appealing, elegant style. Cons: The metal feet are not covered, and it can scratch flooring, but easily taken care of with felt foot pads. It can become unstable if larger wine bottles are placed at the top. If you’re looking for a compact wine rack that holds a good amount of wine bottles, look no further. 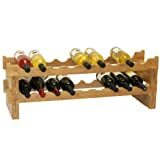 The Mango Steam 32-Bottle wine rack is a free standing, compact wine rack with a beautiful contemporary design. The overall design is a great addition to any room, and the glass top allows it to have some extra functionality. The steel construction has a durable powder coating, and there are four-floor adjustable levelers to create greater stability. The rack is designed to hold 32 of the 750 ml standard sized wine bottles. The crisscross construction with metal stabilizers and glass top gives it a sleek modern appearance. The compact size is perfect for areas that have limited space. The Mango Steam is a modern, compact, sturdy, and functional rack to store your favorite wines. Pros: Easy assembly, modern and sleek design, and holds a decent amount of wine bottles of varying shapes. It is compact, can easily fit in many smaller spaces, and the glass top is multifunctional. Each steel leg comes with adjustable levelers to increase stability. Cons: Assembly includes bolts and a wrench, and on occasion, not all bolts or the wrench were included. Keep your wine easily accessible in this attractive wine rack. The decorative rack can be conveniently placed on a cabinet, table or bar so that it’s always within easy reach. The rack holds up to six wine bottles. Also, the large bottle slots will accommodate bottles of varying diameters, even the larger 750 ml size bottles. This rack’s design resembles the barrels used in wine production. The aged metal appearance of the frame compliments both modern and traditional home décor. This exceptionally stable unit is the perfect way to display your favorite vintages. Has someone been sipping your wine? Lock it up! And keep the key. The wine jail is sturdy with an antique rustic look of a rich bronze color with a black undercoat. Two renaissance decorative panels are across the front with ornate scrollwork. Thick structured bars guard up to 46 bottles of wine in various sizes. Holds large champagne bottles, small wine coolers, and everything in-between. The Wrought Iron Wine Jail arrives fully assembled. Just remove from the box and load it up with your favorite vintage. The Wine Jail has a locking bar on the front for a padlock which is not included. Pros: The Wine Jail can sit on the floor or be mounted on the wall, is very sturdy, a very attractive piece of art, and it actually does keep your wine locked up and safe from intruders or children. Cons: It is larger than the picture displayed-if you didn’t measure-it may be too big for the location that you had in mind. A perfectly designed wine rack for the more serious wine lover and collector who needs space for up to 72 bottles of wine. The design keeps the wine bottle at a perfect degree to help your wine last longer because the tilt keeps the wine in partial contact with the cork to keep it moist constantly. The solid wood structure is a sturdy design to prevent the bottles from being broken. It is constructed with 6 layers of 12 bottle opening on each tier. You will be able to assemble the rack with ease because there is no loose hardware to misplace or hand tools required. The 4 Family 72-Bottle Holder Wine Rack is just the ticket for storing and displaying your wine collection. Pros: Easy to assemble, solid wood design creates a sturdy structure, holds up to 72 bottles of wine, an attractive way to store your wine collection, and is the perfect size for the more serious wine collector. Cons: The wine bottles need to be about the same size and shape, not all will fit properly, and the bottle may shift forward allowing the back end to slip from the cradle. Wine racks are available in an eclectic range of designs. In order to find your perfect match, you need to consider your goals and style options. Five considerations are particularly valuable in your search. Size of your wine collection – One of the first parameters to establish is size. Racks range from small units housing 24 bottles to custom designed racks for your wine cellar. If you are collecting 20 – 30 bottles for consumption in the near future, the smaller units would be more practical. If you are approaching your wine collecting on a long-term basis and will be aging your vintages, you need a more elaborate storage system. Targeting the number of bottles you intend to store will initially direct your quest. Available space – Hand-in-hand with the size of your collection is the available space in your home. First identify a location that protects the wine. The temperature should be about 55 degrees and remain consistent. A space subject to temperature fluctuations can increase the rate of oxidation and impair the quality of the wine, so you want to choose a space which is not close to a window or a heating vent, and which is far from large appliances like your refrigerator, oven or laundry units. Similarly, the space needs to be free from ultra violet rays. Another reason to select a spot away from your windows, this also means your storage area should avoid fluorescent light within the home. Once you find a spot that will protect the quality of your wine, you can attend to the basics. What length, width and height measurements will your space accommodate? Style of your home – Wine rack designs will complement most home décor styles. Choose from traditional wood racks or modern metal racks, and complement them further with specialty racks. Small wall-mounted, under-the-counter and hanging racks display two to 10 bottles and will highlight your current favorites in an artistic, easy-to-access manner. Like any other home furnishing, you should find a rack that reflects your personality. Functionality – Many wine racks include practical designs or provide for accessories. Do you need a tabletop in the space? Do you have wineglasses you would like displayed in the same unit as your bottles? Do you want a cabinet or other additional storage space for complementary items? Determine any other function your space needs to provide, and any accessories you would like readily available, and incorporate those factors into your search. Budget – As always, in conjunction with considering what style or accessories you would like, you should perform a budget analysis. If your budget is tight right now, a basic rack designed to accommodate fewer bottles will probably best meet your needs. You may even elect modular or stackable units to build on in the future. If your budget is more flexible, you might opt for more elegant designs, or racks that accommodate a larger selection of wines. Wine racks are available in numerous styles. Three of the most popular home models are wine stands or towers, wine tables and wine cabinets. Wine stands designed for a few bottles may fit on your tabletop or counter, while floor towers accommodate a larger collection. Usually free-standing, these wine stands and towers basically only hold the wine bottles and may have artistic or rounded designs at the top. In contrast, wine tables add a little more function. They are topped with a flat surface that can be used for display or storage, or as a work space when you open the bottles. Wine cabinets further maximize the functionality of your home rack. While they may have flat work areas or serving spaces, they also specifically include storage areas. Some will include doors that enclose the wine, will others offer an open wine storage side-by-side with enclosed cabinet storage. Your perfect style also includes finding a material that harmonizes with your home décor. Most wine racks are either metal or wood. Metal designs can include iron, polished aluminum or a bronze finish. Wood designs range from simple wood barrels, bamboo and distressed ash wood to mahogany and redwood. Units may also use one material as a base and accentuate it with the other, or add glass table tops or doors. The variety of materials means that you can find a texture, color and tone that matches the rest of your home. If you favor a modern feel, you probably would prefer a metal and glass design. If you prefer to keep it simple, choose a bamboo or ash wood model. If you want to match your other elegant furnishings, a redwood or mahogany cabinet may be your best choice. The sturdiness and longevity of your rack are also impacted by the variety of materials. If this is your first wine rack and you plan to replace it as your collection expands, then bamboo, pine or ash that may warp more quickly may be suitable for your current needs. If you are upgrading your rack or want it last for a long time, you may prefer the sturdier redwood. The majority of wine racks are designed to store your bottles on their sides. The design stems from the formal aging practices for wines purchased as long-term investments. While not essential when the wine will be served in the near future or you turn over your wine inventory frequently, the better practice is still to store the bottle on its side. The primary goal of storing bottles on their side instead of in an upright position is to prevent oxidation. Excess oxidation can turn your fruity delight to a sour vinegar. By placing the bottle on its side, the cork remains moist. As a result, it remains intact and expanded fully over the entrance which prevents oxygen from seeping into the bottle and turning your wine. The majority of advertised wine racks are designed for display in the home. 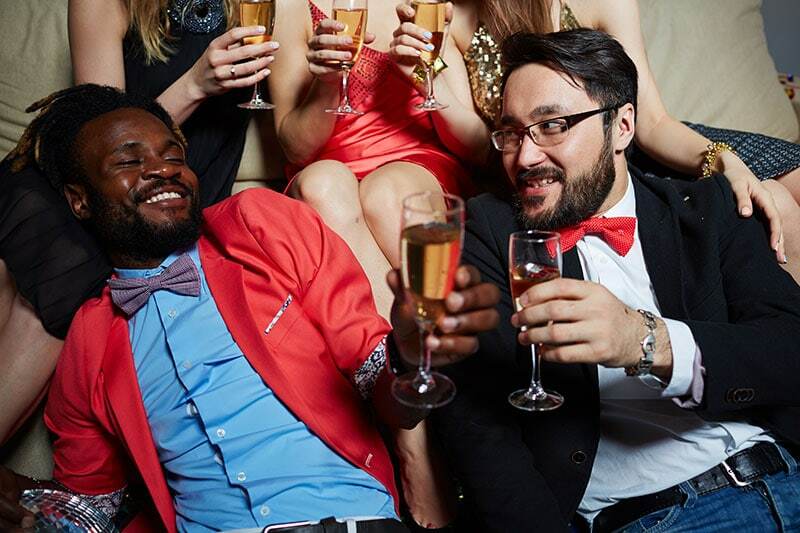 However, if you have a vast collection, you have fragile wines that need careful aging, or you do not have a spot in your home in which you can maintain reasonable temperature or lighting control, you may need to escalate to a wine cooler or wine cellar. Wine coolers are electric cabinets that are fully enclosed and monitor the temperature of the environment. If your wines need special protection but will be served fairly quickly, a wine cooler will probably best meet your needs. When selecting a wine cooler additional considerations are necessary. In addition to selecting a location near an electrical outlet, you need to ensure there is enough open space to prevent heat buildup from the electronics and that there is sufficient room for the door to swing open. Designs will vary regarding function as well. Some will have doors through which you can see the bottles while others are opaque. Some may be compartmentalized to allow different temperatures in each compartment. As you do with the simpler wine racks, you will need to verify the number of bottles the cooler can hold, the stylistics you prefer and any budget constraints before pursuing a wine cooler. If you are serious about your wines and have a substantial collection that requires aging them for years, you probably want an entire separate room that is constructed to maintain the temperature and filter out light. Custom design abounds in this area. You can build a brand-new wine cellar or convert an existing basement. Not surprisingly, this is usually a much larger project which will involve multiple wine racks and requires a more elaborate financial plan. Ultimately, your creativity and budget will govern your selection of a wine rack. You can tailor your search to reflect your embrace of the simpler things of life or your preference for more elegant surroundings. Consider your wine collection, your available space and your home décor. Factor in any special function or accessory needs along with your budget guidelines. Then bring home the perfect wine rack for you, carefully arrange your bottles and savor the bouquet of your well-stored wine. Cheers!